Salvation And Survival: Israel: What Does The Future Hold? Israel: What Does The Future Hold? Yesterday morning, as I awoke, I was keenly aware that the nation of Israel was deciding on its next leader. And just as in the days of old, the decision they would make would have important consequences. For most of its early history, the nation of Israel was led by judges and prophets. The prophets relayed the word of God, while the judges counseled the people in times of peace, and led them to battle in times of war. 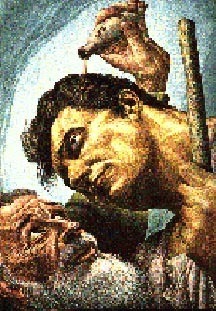 Then in the year 880 BC, after 400 years of being led by prophets and judges, the people approached the Prophet Samuel, desiring a king “like all the other nations.” Although God was disappointed in their lack of faith in relying on Him to reign over them, He nevertheless allowed Samuel to anoint Saul as Israel's first king. We know the rest of the story ... Saul fell out of favor with God for disobeying His command to wipe out all the inhabitants of the Nephilim tribes in the Promised Land. God then anoints David, a young shepherd, as King over Israel. It is through his line that the true King of Israel, Jesus Christ, would be born. God is Sovereign in all that He does and allows to happen. And that is what I am telling myself this morning, as it appears that Benjamin Netanyahu has been re-elected as the Prime Minister of Israel. The choices couldn't have been any more stark, or any more grave. Netanyahu had vowed that there will be no more concessions to terrorists while on his watch. His primary opponent based his election promises on Socialism and Negotiations; both of which would have been injurious to Israel and the rest of the world. They've been there before, and it did not work in their favor. In fact, the Bible records the consequences of Israel splitting their nation in two after the death of King Solomon in 796 B.C. The unified nation of Israel had been strong and able to hold its own against the nations that surrounded them. But the division came as a result of tribal discord and political unrest. This left the once strong, unified nation a weak, divided nation; and it fell prey to the re-emerging empires of Egypt, Assyria and later, Babylon. The peoples of the Northern Kingdom, Israel; and the Southern Kingdom, Judah, were carried off into captivity and scattered across the world. Now, after 2,000 years, they have returned to their homeland, and even recaptured Jerusalem, the City of David, where the Lord will one day sit upon His earthly throne. But political unrest and discord have once again settled upon the land of Israel. The nations of the world have sought concessions of "land for peace", while continuing to plan Israel's total destruction. I believe the future of the nation of Israel hung in the balance yesterday during the nation's elections. Depending on who won, Israel would either determine victory over her enemies -- or assure her own eventual extermination. At the crux of the issues facing Israel is the Palestinian state. As Breitbart.com points out, "The 'two-state solution' for peace—which is the only platform largely supported by the international community—has shown to be a complete failure in securing peace for both Israel and the Palestinian people. With the signing of the 1993 Oslo Accords, Israel became the first country to give Palestinians self-governing land. In 2005, Israel forcibly removed all Jews from the Gaza Strip in exchange for hopes of an elusive peace. In both instances, and other “land for peace” endeavors, the result has always been the same: the creation of hostile Palestinian entities that have chosen to seek Israel’s destruction through militant conquest and delegitimization practices." In ancient history, the nation of Israel had to live in fear of being conquered by Egypt, Assyria and Babylon. Today, they are surrounded by state sponsors of terror like Iran and the emerging Caliphate of ISIS. We saw what happened nearly 2600 years ago when they did not strengthen themselves from within -- their weakened state left them vulnerable to oppressive regimes. Today, the same holds true; only the stakes are higher. If Israel weakens their position, making further concessions or withdrawals, they won't just be scattered across the world -- they could very well be totally decimated by a nuclear Iran, or Iran's proxies. 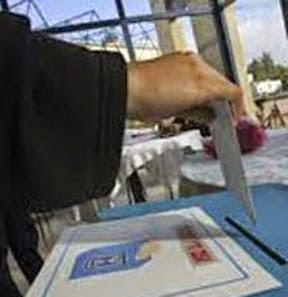 Voter turnout in Israel was relatively high, showing that the people are aware of the gravity of this election. (Of course, we cannot ignore the fact that busloads of Arab voters were transported in -- seems as if voter fraud knows no national boundaries). But ultimately, with the apparent victory of Benjamin Netanyahu, -- who has declared there will be no Palestinian State as long as he is in office -- the nation has secured (for now) the unconditional, eternal covenant that YHWH made with their ancestor Abraham -- to be restored to, and possess, the land He gave them. Let's pray that they have elected the best man; one who will honor that sacred covenant. And let them remember that they are not to be like "all the other nations". It is prophesied by the Apostle Paul that Israel will one day come into its full purpose of world leadership. Is Netanyahu the man who will fulfill that prophesy? Only God knows the "big picture" ... but when the final victory is declared, we will have a pretty good idea of where their immediate future lies. Jeremiah 23:1-4 "Woe to the shepherds who destroy and scatter the sheep of my pasture!” declares the Lord. Therefore thus says the Lord, the God of Israel, concerning the shepherds who care for my people: “You have scattered my flock and have driven them away, and you have not attended to them. Behold, I will attend to you for your evil deeds, declares the Lord. Then I will gather the remnant of my flock out of all the countries where I have driven them, and I will bring them back to their fold, and they shall be fruitful and multiply. I will set shepherds over them who will care for them, and they shall fear no more, nor be dismayed, neither shall any be missing, declares the Lord."